Neuropeptides are essential cell-to-cell signaling molecules that influence diverse regulatory and behavioral functions within biological systems. Differing in their amino acid sequences and post-translational modifications, hundreds of neuropeptides are produced via a series of enzymatic processing steps, and their levels vary with location, time, and physiological condition. Due to their wide range of endogenous concentrations and inherent chemical complexity, using mass spectrometry (MS) to accurately quantify changes in peptide levels can be challenging. Here we evaluate three different MS systems for their ability to accurately measure neuropeptide levels: capillary liquid chromatography-electrospray ionization-ion trap (CapLC-ESI-IT) MS, ultraperformance liquid chromatography-electrospray ionization-quadrupole-time-of-flight (UPLC-LC-ESI-Q-TOF) MS, and matrix-assisted laser desorption/ionization-time-of-flight (MALDI-TOF) MS. Specifically, eight sample mixtures composed of five neuropeptide standards, with four technical replicates of each, were labeled with H4/D4-succinic anhydride, followed by relative peptide quantitation using the three MS platforms. For these samples, the CapLC-ESI-IT MS platform offered the most robust ability to accurately quantify peptides over a concentration range of 1200-fold, although it required larger sample sizes than the other two platforms. Both the UPLC-ESI-Q-TOF MS and the MALDI-TOF MS systems had lower limits of quantification, with the MALDI-TOF having the lowest. By implementing several data acquisition schemes and optimizing the data analysis approaches, we were able to accurately quantify peptides over a three orders of magnitude concentration range using either the UPLC or MALDI-TOF platforms. Overall these results increase our understanding of both the capabilities and limits of using MS-based approaches to measure peptides. The online version of this article (doi: 10.1007/s13361-012-0481-0) contains supplementary material, which is available to authorized users. Neuropeptides are signaling molecules that transmit information from cell to cell, modulating a variety of activities within the nervous system that influence an organism’s function and behavior. They are initially expressed as prohormones, which undergo a large number of enzymatic processing steps in the cells to produce the final bioactive peptides [1, 2, 3]. The functional effects of specific neuropeptides are dependent on their final chemical forms as determined by the particular enzymes present in the tissue and the order in which the enzymes process the prohormones. A large number of neuropeptides—differing in their amino acid sequences and post-translational modifications (PTMs)—are produced within distinct brain regions. Furthermore, the peptidases responsible for prohormone processing may be differentially expressed in tissues [4, 5, 6] or during development , resulting in peptides that are differentially expressed, modified, cycled, and distributed. Thus, the specific forms and quantities of neuropeptides vary by region, upon release, and/or among developmental stages, and their dynamic range spans many orders of magnitude. These factors, combined with neuropeptides’ inherent low abundance and the complexity of the surrounding biological matrices, present a variety of analytical challenges. Accordingly, a number of technologies have been tailored to enable peptide discovery, essentially launching the field of study known as neuropeptidomics [3, 8, 9, 10], which endeavors to characterize the peptides present [3, 11] or released [12, 13, 14] in the nervous system. Neuropeptidome studies may also involve quantitation of neuropeptide level changes arising from different behavioral states, gene knockouts, or exposure to chemicals or drugs [15, 16, 17, 18, 19, 20, 21]. These examples involve tissue samples and represent the range of neuropeptide applications that have emerged. MS-based technologies have proven to be quite effective for peptide quantitation, with perhaps the two most common strategies being categorized as label-free [18, 22, 23, 24, 25] and isotopic labeling [15, 16, 17, 20, 21]. Promising alternatives include a variant on the label-free method, termed spectral counting, which counts the number of times specific peptides are detected [26, 27, 28, 29], the tried and true standard addition approach [20, 30, 31, 32, 33], and MS combined with microfluidics to probe the length of a channel that has peptides bound on it [34, 35]. Most label-free methods rely on the linear relationship between the intensity of the MS signal and the amount of analyte  in order to directly compare analyte levels. An important advantage is that these methods typically require fewer sample handling steps, which generally results in less sample loss. Therefore, label-free quantitation tends to work well for small-volume samples and low-abundance peptides. Another benefit is that these methods result in less complex samples compared with labeling strategies. There is also less chance of matrix interference when labeling chemicals are not used; this, combined with reduced sample losses, suggests that label-free methods may produce a higher coverage of peptides . In addition, each sample is analyzed in parallel, so theoretically there is no limit to the number of samples that can be used for these types of MS comparison studies. However, there are caveats: because label-free approaches compare peptide levels from different MS analyses, there is a potential for larger systematic errors and poorer quantitation accuracy as compared to labeling methods [36, 37]. In isotopic labeling, the samples are differentially labeled and combined together, and then analyzed in a single MS or LC-MS analysis in order to compare the differences in peptide levels. This eliminates the analysis-to-analysis discrepancies that can result when using label-free strategies. As a minor point, isotopic labeling for peptidomic studies creates multiple tagged molecules for each peptide (distinguishable via their mass differences in MS or tandem MS modes) [3, 11, 36]. Although this makes the samples more complex, overall, isotopic labeling tends to provide a higher accuracy of quantitation than label-free approaches . Numerous peptide quantitation studies have relied on isotopic labeling and MS [15, 16, 17, 20, 21, 38, 39, 40, 41, 42, 43, 44, 45, 46, 47]. The labeling reagents most commonly employed for peptide quantitation of biological samples are the H- and D-forms of acetic anhydride [41, 44], succinic anhydride (SA) [15, 20, 39, 41], and 4-trimethylammoniumbutyryl labels [16, 40]. These reagents react with the primary amines to label the free N-termini of the peptides, as well as the side chains of any internal lysine residues, and generate differentially labeled peptides having a mass difference of several Da, which in turn allows for differentiation and comparison. Other labels (e.g., urea and formaldehyde) have also been developed and tested using peptide/protein standards [46, 47, 48, 49, 50]. Validation studies have evaluated the ability of isotopic labeling and MS to accurately quantify a single peptide standard or digests from a single protein over a concentration range of up to two orders of magnitude [43, 46, 47, 49]. In other studies, mixtures of peptide standards, with each peptide having the same concentration, were labeled differentially and combined in a 1:1 molar ratio  or ratios ranging from 4:1 to 1:4 ; these peptide mixtures were then quantitated via MS and the accuracy validated. The examples cited above are well-performed validation studies, but typically used mixtures that did not mimic the large dynamic range of endogenous peptides that are present in a biological sample. Does this mean more studies are needed? Do these labeling schemes provide accurate quantitative results in samples containing peptides in amounts that span three or more orders of magnitude? Are there specific MS platforms better suited to investigate such real-world samples? If so, which data acquisition and analysis approaches work best? In an effort to answer these questions, we compared the performance of three MS platforms that have been previously employed for peptide quantitation—capillary liquid chromatography-electrospray ionization-ion trap (CapLC-ESI-IT) MS , ultraperformance liquid chromatography-electrospray ionization-quadrupole-time-of-flight (UPLC-LC-ESI-Q-TOF) MS , and matrix-assisted laser desorption / ionization-time-of-flight (MALDI-TOF) MS . We quantified a number of isotopically labeled neuropeptides, with ratios ranging from 12:1 to 1:12, in mixtures with peptide concentrations ranging over three orders of magnitude (within each mixture). We selected SA (H4 and D4 forms) as the labeling reagent because of its high efficiency and stability throughout the sample preparation and measurement processes on all MS platforms used. In addition, the 4 Da difference that exists between the H/D labels allowed us to distinguish the isotopologue clusters of the labeled and unlabeled forms of the peptides, and the co-elution of differentially labeled peptides from reversed-phase columns . Although we expect that the other labels would generate similar results, we did not confirm this. Our results demonstrate that among the three platforms used here, CapLC-ESI-IT MS is the most robust option for quantifying peptides accurately over a wide concentration range. However, by optimizing the data acquisition to ensure that the peptide signals reach a threshold, and other adjustments, the quality of the results using the other two systems can be appreciably increased, allowing us to obtain the same dynamic range of performance as with the CapLC-ESI-IT MS system. Parameters other than dynamic range can also be considered when evaluating performance; for example, with MALDI MS we were able to quantify the peptide ratios at lower concentrations compared with the other platforms tested. Chemicals were obtained from Sigma-Aldrich (St. Louis, MO, USA) unless otherwise stated. The peptide standards for MALDI-TOF calibration were from Bruker Daltonics (Billerica, MA, USA). Milli-Q water was prepared with a Milli-Q 119 filtration system (Millipore, Bedford, MA, USA). HPLC-grade solvents were purchased from Thermo Fisher (Fair Lawn, NJ, USA). Five neuropeptide standards (bradykinin1-7, NPSSFVRIamide, bradykinin, angiotensin I, neurotensin), as shown in Table 1, were individually dissolved to concentrations varying from 1 to 100 μM. The standards were mixed together to generate eight different peptide mixtures of each of the five peptides at various concentrations and ratios. The eight peptide mixtures were divided into two sets of four, and each set was labeled with either 4 M H4-(light) or 4 M D4-(heavy) SA dissolved in dimethyl sulfoxide (DMSO), after the pH of each set was adjusted to ~9 using phosphate buffer (1 M, pH = 9.5), or 1 M NaOH if needed. The samples were then vortexed, centrifuged, and incubated at 20–22 °C for 15 min, followed by a pH readjustment with 1 M NaOH to ~9. The entire procedure was repeated six times for increased labeling efficiency. After the last round of labeling and pH adjustment, 2.5 M glycine was added, and the samples were incubated for 1 h to remove excess free labels. A pH adjustment and addition of 2 M hydroxylamine in DMSO followed in order to remove the labels from the tyrosine, serine, and threonine residues of the peptides. After the labeling was complete, the H/D-labeled samples were combined, PepClean C18 spin columns (Pierce, Rockford, IL, USA) were applied to desalt the samples, and the peptides were then eluted using a 70 % aqueous acetonitrile (ACN) solution. Following the removal of the organic solvent in a SpeedVac concentrator (Thermo Scientific, San Jose, CA, USA), the samples (20 μL each) were ready for MS analysis. The sample preparation procedure described above resulted in four different samples (Samples 1–4) containing various expected ratios of H/D-labeled peptides (12:1, 8:1, 4:1, 2:1, 1:1, 1:2, 1:4, 1:8, 1:12), with final peptide concentrations ranging from 250 nM to 300 μM, producing peptide concentration differences of up to 1200-fold (see Supplemental Table S1). Each sample was labeled in a forward and a reverse direction: the combination of H-SA labeled mixture and D-SA labeled mixture as a forward label, and the combination of D-SA labeled mixture and H-SA labeled mixture as a reverse label. In addition, each sample had four labeling replicates, resulting in a total of 32 samples for peptide quantitation on each MS platform (see supplemental Table S1). The three MS platforms used for these comparative peptide quantitation studies were: a UPLC system coupled to an ESI-Q-TOF mass spectrometer (Premier, Waters Corporation, Milford, MA, USA), a capillary LC (Waters) coupled to an ESI-IT mass spectrometer (HCTultra, Bruker Daltonics), and a MALDI-TOF mass spectrometer (UltrafleXtreme, Bruker Daltonics). Whereas the sample mixtures (1 μL of each) were directly injected into the CapLC-ESI-IT instrument, in order to generate a suitable concentration range for the other two platforms, the mixtures needed to be diluted ~30-fold and 100-fold for the UPLC-ESI-Q-TOF and MALDI-TOF instruments, respectively. UPLC-ESI-Q-TOF MS The NanoAcquity UPLC system (Waters), equipped with a reversed phase C18 column (Atlantis dC18, 75 μm i.d. × 15 cm, 3 μm particle size, and 100 Å pore size, Waters), was used to separate the samples with a mixture of solvent A (100 % water with 0.1 % formic acid [FA]) and solvent B (100 % ACN with 0.1 % FA). The 90 min gradient for the UPLC system with a flow rate of 400 nL/min was generated as follows: 1 % solvent B in 0–30 min (isocratic); 1 %–50 % solvent B in 30–60 min (linear); 50 %–90 % solvent B in 60–65 min (linear); 90 %–1 % solvent B in 65–70 min (linear); 1 % solvent B in 70–90 min (isocratic). Only MS spectra with a scan range of m/z 300–2000 were collected. CapLC-ESI-IT MS Samples were separated on a CapLC system (Micromass, Manchester, UK) with a reversed-phase C18 column (Acclaim PepMap100 C18, 300 μm i.d. × 15 cm, 3 μm particle size, and 100 Å pore size, Dionex, Sunnyvale, CA, USA). The solvent gradient with a flow rate of 2.5 μL/min was generated by mixing solvent A (95 % water and 5 % ACN containing 0.1 % FA and 0.01 % trifluoroacetic acid [TFA]) and solvent B (aqueous 95 % ACN containing 0.1 % FA and 0.01 % TFA). The 55 min gradient for the LC system was created as follows: 3 %–25 % solvent B in 0–10 min (linear); 25 %–50 % solvent B in 10–40 min (linear); 50 %–80 % solvent B in 40–43 min (linear); 80 % solvent B in 43–45 min (isocratic); 80 %–3 % solvent B in 45–48 min (linear); 3 % solvent B in 48–55 min (linear). Data were acquired for a MS scan range of m/z 300–2000. MALDI-TOF MS Samples (0.5 μL) were spotted onto a stainless steel MALDI plate (Bruker Daltonics), with 0.5 μL of either saturated 2,5-dihydroxybenzoic acid (DHB) or alpha-cyano-4-hydroxycinnamic acid (CHCA) as matrices. Three technical replicates were collected for each spot, with every spectrum comprised of 10 acquisitions of 100 laser shots. The identifications of peptide peaks were performed by assessing the combination of charge states, mass matches, and LC retention times. The difference between the H- and D-labeled peptides with a +1 charge state is 4 Da, and with a +2 charge is 2 Da. For the data acquired by UPLC-ESI-Q-TOF MS and CapLC-ESI-IT MS, extracted ion chromatograms were examined for both the light-and heavy-labeled peptides, and the mass spectra across the entire elution period for both sets of peaks were summed for quantitation. The intensities of the most abundant isotopic peaks for either the H- or D-labeled peptides were used to calculate the ratios. For the data acquired by MALDI-TOF MS, after identification of the differentially labeled peptides, the most abundant isotopic peaks were used for ratio calculations. We designed a set of experiments using a variety of peptide mixtures to determine what conditions (e.g., MS platforms, analyte ratios, data acquisition and analysis, etc.) yielded the most accurate relative quantitation of neuropeptides from a mixture. Our sample sets represented variations in neuropeptide amino acid sequences, PTMs, and concentrations. Each sample contained a mixture of five representative neuropeptide standards with masses spread across 500–2000 Da (Table 1), a mass range that is suitable for peptide detection by the three MS platforms. Two out of these five neuropeptides are modified by amidation or pyroglutamylation, two common PTMs present in neuropeptides. These samples also had expected ratios of differentially labeled peptides varying from 12:1 to 1:1 to 1:12, and contained peptide concentrations ranging from 250 nM to 300 μM. We optimized the samples for two of the MS platforms to ensure the best instrument performance by diluting them 30-fold (~8 nM to 10 μM) and 100-fold (2.5 nM to 3 μM). These mixtures matched an important portion of the range of physiological concentrations of neuropeptides, which spans from micromolar to picomolar . Furthermore, in order to allow for comparisons between different samples, only one of the parameters, either the ratio of differentially labeled peptides or the peptide concentration, was modified when designing these sample mixtures. To account for variations that may result from sample preparation and instrumental fluctuation, four technical replicates were labeled in parallel, and samples were also labeled in both forward and reverse directions. In this way, the potential effects of these various factors on peptide quantitation were addressed. By using SA to label each of the five peptides (supplemental Table S1) in the mixtures, the labeled peptides were 100 Da (H-SA) or 104 Da (D-SA) heavier than the original (unlabeled) peptides (Figure 1). These results indicate that greater than 99 % of the peptides in our mixtures were labeled, regardless of the concentrations of other peptides present in the mixtures; this is because of the more than 1000-fold excess of labeling reagent to peptide (Figure 1). Our results also demonstrate the stability of the labeled peptides during storage as well as during analysis with the three MS platforms we used. This stability is a prerequisite for successful follow-up studies. The ratios of the peak intensities of the H- or D-labeled peptides in the MS spectra were compared with the theoretical ratios. A 20 % error in the peptide ratios was used as the cutoff, since this value is often used as an accuracy threshold for bioassays, and comparable values have been used in a number of studies to validate isotopic labeling approaches [47, 49, 52]. Here, whenever the observed ratio of isotopically labeled peptides was within 20 % of the expected ratio, the quantification was considered to be a success. CapLC-ESI-IT MS One microliter of each of the eight peptide mixtures (with four replicates for each mixture) was injected into the CapLC-ESI-IT MS system. The MS spectra across the entire elution time for all H- and D-labeled peptides were summed, and the ratios were calculated using their most abundant isotopic peaks. Representative MS spectra of two of the peptides, bradykinin 1–7 and bradykinin, are presented in Figure 2a and b; the ratios of the differentially labeled peptides are within 2 % of the expected ratios of 1:1 and 1:2. Representative data of the ratios and concentrations for the five peptides in the two mixtures are shown in Figure 2c and d, with peptide mixture 1-F having a concentration range from 0.25 to 100 μM (400-fold range), and peptide mixture 2-F from 0.25 to 300 μM (1200-fold range). Samples 1-F and 2-F have the same expected ratios for the five peptides, but different concentrations. The observed average ratio of each of these differentially labeled peptides was within 20 % of the expected ratio, even for peptides (e.g., angiotensin I) with the highest expected ratio of 12:1 (Figure 2c and d). Over this range, the peptide levels did not change the observed quantitation accuracy (Figure 2c and d), nor did the accuracy change when changing peptide ratios (data not shown). For peptides with an expected ratio of 1:1, the relative error for the observed ratio was typically less than 10 %. Since this platform generated one predominant charge state (either +1 or +2 charge) for each peptide, peptides with only one charge state were quantified here (Figure 2). In summary, the CapLC-ESI-IT MS system allowed us to obtain quantitative data for most samples, and the results were consistent between the forward and reverse labeling (data not shown). UPLC-ESI-Q-TOF MS This platform has been widely employed in the quantitative peptidomics of various biological samples [15, 45, 49], in part because of its high mass resolution and mass accuracy. Nanoscale UPLC-ESI-Q-TOF MS requires lower amounts of samples to be injected than CapLC-ESI-IT MS; therefore, we diluted the samples ~30-fold. Our initial analysis of these samples demonstrated a narrow linear range of ~50-fold and some inconsistencies among multiple charge states of the same peptide. In order to understand why, we selected one mixture, sample 4-R, made a serial dilution, and then injected 1 μL of eight dilutions into the UPLC-ESI-Q-TOF mass spectrometer to seek ways to improve the quantitation. Our results suggest that if the MS signals for the peptides being measured fall within the linear region of the detector of the UPLC-ESI-Q-TOF instrument (ideally from Log [MS intensity] 2 to 4), the ratios of H/D-labeled peptides are mostly within the 20 % threshold, even for peptides with high ratios (e.g., bradykinin, with an expected ratio of 8:1 in Series 6–8 [+1 charge], and in Series 1–4 [+2 charge]) (Figure 3a and b). On the other hand, if the peptide does not produce an MS signal within the linear range (e.g., due to detector saturation), the differences in peptide levels are distinguished but underestimated (e.g., bradykinin in Series 5–8 [+2 charge]) (Figure 3b). Representative MS spectra of H- and D-labeled bradykinin (+1 and +2 charge states) are shown in Figure 3c and d. For isotopically labeled peptide pairs with a ratio of 1:1, no significant differences were observed, even if the detector was saturated (Figure 3e–h). Often, ESI generates peptides with multiple charge states, and we commonly observed +1 and +2 charge states. We investigated the measurement accuracy for both charge states. A comparison between Figure 3a and b suggest that the presence of MS signals within the linear region are required for either +1 or +2 charged peptides to be accurately quantified. Interestingly, the MS intensities of peptides with different charge states vary. Often the +2 charge peptide had a much higher MS signal than the +1 charge peptide, with a two-order of magnitude difference observed in many cases (Figure 3a, b, and e, f). It appears that the peptide with the +2 charge usually saturated the detector before the same peptide with the +1 charge. We took advantage of this observation by selecting ions with the appropriate charge state to quantify, and as a result, the observed ratios for all of the peptides were within 20 % of the expected values. Compared with previous studies showing that ESI-Q-TOF MS has a linear range below 100-fold for quantitation [49, 53], the UPLC-ESI-Q-TOF MS approach evaluated here successfully quantified peptide mixtures with a concentration range of >1000-fold (Figure 4) and peptides in the low femtomole range (Figure 3b, Series-1). MALDI-TOF MS One key advantage of MALDI-TOF MS, compared with other MS platforms, is that it requires much lower sample amounts for analysis and can detect peptides at attomole levels. Therefore, we diluted our samples 100-fold for MALDI-TOF MS, spotted 0.5 μL of the diluted samples with either DHB or CHCA as matrices on the MALDI target, and made a comparison among the samples. Ten acquisitions of MS signals were obtained uniformly across a single sample spot and added together for quantitation purposes. Similar to previous reports [47, 54], our initial results suggested that without any optimization, MALDI analysis is able to differentiate peptide levels, even for the lowest level peptides, but may only provide accurate quantitation for peptides with a concentration difference of about 20-fold or less (data not shown). However, by selecting the appropriate data acquisition protocols, we were able to improve the effective dynamic range of the MALDI-TOF instrument. First, we made sure that the higher abundance peptides did not saturate the detector. Saturation of the MALDI-TOF detector is easily identified, and often can be simply fixed by modifying the parameters of the mass spectrometer (e.g., laser power). In addition, we required the peak intensity of peptides to be above a certain signal-to-noise threshold, and optimized the acquisition parameters to make sure that the lower concentration peaks met this threshold requirement, even for the peptides at the lowest abundance. The data obtained with DHB as the matrix, and the optimized acquisition parameters, are shown in Table 2. For most of the peptides, the observed ratios were within 20 % of the theoretical ratios. However, the dynamic range for MALDI-TOF MS is sample-dependent. For Sample 4-R, MALDI-TOF MS provided accurate quantification of peptides over a range of ~1200-fold, from 2.5 to 3000 pM. With Sample 2-F and the same concentration range, peptides could be accurately quantified over a range of ~240-fold, from 12.5 to 3000 pM. But for Sample 1-F, accurate quantitation of peptides could only be obtained over a range of ~20 fold, from 62.5 to 1000 pM. Notably, two types of peptides were harder to quantify by MALDI-TOF MS. One type is peptide pairs having a high expected ratio (Table 2, FVRIamide and angiotensin I in Sample 1-F), and the other is low abundance peptides that generate low MS signals (Table 2, bradykinin and neurotensin in Sample 2-F). When this situation was combined, we generally observed a larger ratio of the differentially labeled peptides than the expected ratio (Table 2, FVRIamide and angiotensin I in Sample 1-F, and neurotensin in Sample 2-F). This may be due to the more prominent effects of ion suppression of one labeled peptide by another. However, the observed ratio still correctly reflected the actual 1:1 ratio, even if the peptide was at a low level (Table 2, angiotensin I in Sample 4-R, and bradykinin 1–7 in Sample 2-F). It is also worth mentioning that if we want to obtain relatively accurate quantitation of one specific peptide in low abundance, instrumental parameters can be adjusted or optimized just for that peptide of interest; using these approaches we can acquire MS signals above a threshold, while taking care not to saturate the detector. One single MS acquisition, instead of several summed spectra across the sample, is enough to achieve good quantitation accuracy. As shown in Figure 5, the accuracy for low abundance FVRIamide and angiotensin I are 7 % and 3 %, respectively, after optimization and single MS acquisition, whereas previous results without such adjustments reported larger errors, 106 % and 76 % respectively (Table 2, Sample 1-F). These results could only be obtained for peptides above the low femtomole level, the limit of quantification (LOQ) for our MALDI-TOF MS platform. It is also important to ask, what are the effects of the MALDI matrix? Besides DHB, we tested the other common matrix, CHCA. As shown in Table 3, the use of DHB led to an accurate quantitation of most peptides in Sample 4-R over a concentration range of ~1200-fold, from 2.5 to 3000 pM; in contrast, CHCA was less robust and the percentage of error was higher for all five peptides examined using this matrix as compared to DHB. Because CHCA is reported to provide a more consistent MS signal across the sample spot , we expected it to provide better quantitation performance. It is possible that the differentially labeled peptides co-crystallized differently in DHB than CHCA. More likely, perhaps DHB and its “sweet spots” facilitate the enrichment of peptides into a small region. This would lead to a more intense MS signal, making it easier to meet threshold requirements, and thus provide a wider concentration range and a lower LOQ. For most peptides, low femtomole or even lower levels of peptides are required when using DHB as a matrix for accurate quantitation, consistent with previous studies . Although a MALDI-TOF mass spectrometer is not commonly considered to be the ideal instrument for peptide quantitation , our results suggest that MALDI-TOF MS can differentiate changes in peptide levels. Using an isotopic labeling approach, we compared the ability of three different MS platforms to accurately quantitate neuropeptides in mixtures having concentration ranges greater than three orders of magnitude and various complexities. The three MS platforms performed differently, with unique performance specifications and working concentration ranges. The CapLC-ESI-IT system handled a wide dynamic range of peptides with an LOQ of ~100 fmol. 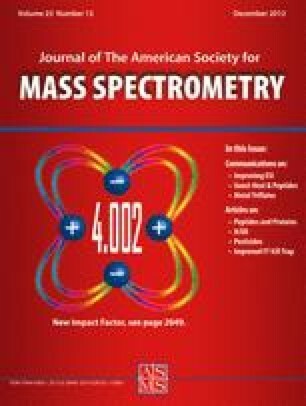 By selecting the appropriate charge state to quantify, the dynamic range of accurate quantitation using UPLC-ESI-Q-TOF MS has been improved by at least one order of magnitude over previously reported results [49, 53]. Prior studies have demonstrated that MALDI-TOF MS can provide quantitative results for peptides with relatively narrow concentration ranges (perhaps less than two orders of magnitude [47, 54]). Here, by optimizing the acquisition parameters, the ability of MALDI MS to allow us to quantify peptides was improved to greater than 1200-fold (although this was sample-dependent). Despite having the lowest LOQ among the three platforms, the MALDI-TOF instrument provided simpler data analysis. The approaches outlined here led to a 10-fold larger dynamic range than previously reported for isotopic labeling approaches [36, 46, 47, 49]. It is easier to quantify peptides close to the 1:1 ratio, but such ideal situations are not always encountered in practical neuropeptide measurements; therefore, understanding the limits of the strategies being used to measure peptides is important. Although the current study is limited to samples composed of five neuropeptide standards, most tissue/brain samples contain hundreds to thousands of neuropeptides, which may make quantitation more complex than the scenarios presented here. While additional chromatographic separation and other clean-up steps may be necessary for real-world tissue samples, the approaches developed using the well-defined samples assayed here should aid in achieving such measurements. Clearly, the MS platforms evaluated in this study are valuable and generalizable, but we must keep in mind that instrument specifications will inevitably change as the technology evolves, and thus, will require ongoing validation. The authors thank Dr. Peter Yau and Dr. Brian S. Imai at the Biotechnology Center of UIUC for assistance with UPLC-ESI-Q-TOF MS. The work was supported by the National Institute on Drug Abuse under Award no. P30 DA018310 and the National Institute of Neurological Disease and Stroke under Award no. R01 NS031609. The content is solely the responsibility of the authors and does not necessarily represent the official views of the award agencies.